View Bed and Breakfast lies around the corner from Leidse Square and the famous De La Mar Theatre. 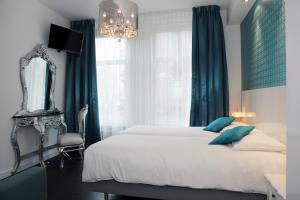 It offers modern, stylish accommodation with flat-screen TV and box-spring beds, right at the Leidsegracht canal. Both bright coloured rooms feature contemporary decorations and large windows. There is a spacious private bathroom that comes with a walk-in shower and free toiletries. Free Wi-Fi is available. The museum district and the Vondelpark are just 1 km away on foot. Amsterdam Central Station is 15 minutes away by tram.